Current Position: Temporarily retired instructor and trainer; active inventor and marketer of equine products, recently featured in Horse & Pony, Horse Capital Digest and on RFD-TV. Avid Trail rider. Advice: Recognize that you are one of the fortunate few to have a “passion” that you can turn into a career. August 2006 - Kim Read-Graff likes to kid that her horse career has gone full circle from Lutz, Florida, where she started riding at age 7 and back again. Probe a little, however, and you find that on the road back to Lutz, she took the “international” in Meredith Manor’s name quite literally. After graduating, Kim returned home to Tampa and landed a position at the Spotted T, an Appaloosa barn with an active breeding program located in Lutz. Kim started a showing and lesson program for several years. "We were a force to contend with at the shows too,” she says, usually walking off with the top ribbons. 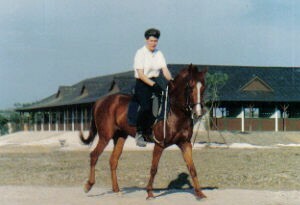 After 2 years in Singapore, Kim & family moved to Bangkok, Thailand, where she applied to the brand new Bangkok Equestrian Center. The local Thai horses were tough, belligerent ponies. “Willing" is not in their disposition,” she says. The Center bought Australian horses, some of which were Thoroughbreds fresh off the track. It was Kim’s job to reschool them and get their understanding of the basics down pat so they could go into the lesson program. She rode four hours daily even though she was pregnant and only took a month off when she delivered her son Justin. “Thailand is a third world country,” Kim recalls, “a hot and difficult place to live.” After a year, the family returned to the USA. “Coming back after 3 years was culture shock all over again,” she says. 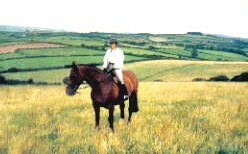 In 1993 she was comfortably settled in, when a contest in an equestrian magazine caught her attention. Riders were asked to submit their resumes to the editors who would then select a lucky four to ride with Olympic champion Bernie Hill and his son Tony at Great Rapscot Farm in the south of England. The editors choose a Brazilian, a Briton, and two Americans. Kim believes that her Meredith Manor background played a significant part in her selection because the other American was also a Meredith Manor graduate. 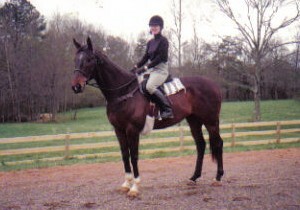 Back in the States again, Kim built a boarding and eventing facility in Georgia called Wind Ridge Manor. Kim recalls working with top quality horses over the farm’s cross country and stadium courses, as a lot of fun—and a lot of work. For Kim, it's not all work though. "I love to trail ride. Horses seem to enjoy it too. The riding trails in Georgia are just beautiful!" Kim retrained Thoroughbreds at Nine Pines for 9 years. But life is often about juggling priorities. So, when Kim’s son qualified for an advanced college-prep program, she decided to sell Nine Pines and move closer to a school that offered the curriculum. The new move brought her full circle back to Lutz and the park trails she rode as a little girl. The only difference, she says, is that the trees are much bigger. When she sold her farm, Kim hung on to a little chocolate palomino filly she purchased as a 2 year old. Now she's a 5-year-old and, with her arena basics down pat, she’s learning to be a trail horse. 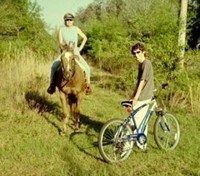 As 16-year-old Justin accompanies them on his bike, the little mare and Kim head out for 40-minute trots. “She’s my exercise gym,” Kim laughs. While Justin channels his energy into academics, Kim now channels hers into inventing horse products to solve problems she’s encountered as a horsekeeper. She sells them via her website and sometimes on eBay. The SafeSoak is an insulated, soft-sided bucket for soaking a horses’ hoof or lower leg. Kim designed it to allow the horse to move around. There is a strap-type handle that allows the caretaker to move the "bucket" along with the horse. Not too many horses will stand still for an entire soak treatment, says Kim from long experience. SafeSoak is soft, safe and insulated to hold heat or cold, and it has a level, padded bottom to be kind to sore hooves. Another product she has created is the Boredom Ball. It's a lightweight ball surrounded by a net of bungee cords. 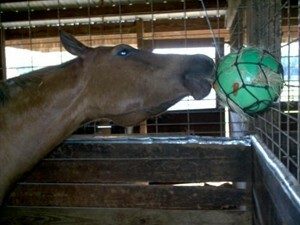 Stuff it with hay, apple slices, carrots or any favorite treat and let it swing while the horse works to get the goodies. “I have more products in my head,” Kim says, “but I’m taking off with these two first". When RFD-TV filmed the SafeSoak for its product spotlight, “The phone was ringing off the hook,” she says. “Every time I’d turn on the computer, someone had bought one from my website”. I want to thank you for the amazing education that you gave me. The fantastic amount that I learned at MM gave me a rock solid foundation that I have built on over the years. For your dedication, vision and absolute practicality I thank you!